The winning images will be displayed in a magnificent exhibition at London’s Royal Geographical Society (with IBG) from July 24th- September 5th 2015. 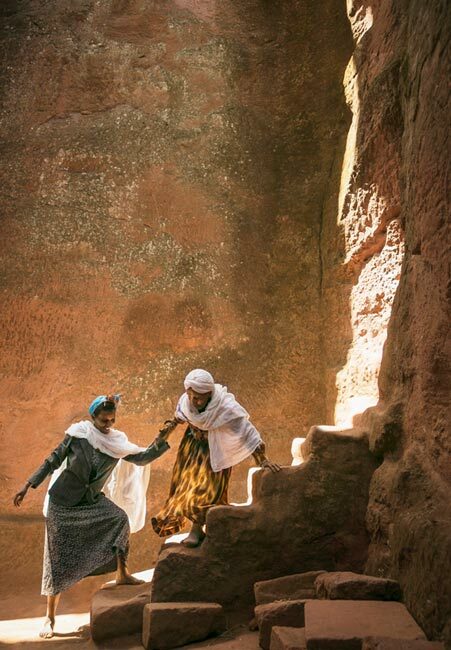 British photographer Philip Lee Harvey took the overall prize – and title of Travel Photographer of the Year 2014 – for elegant portfolios depicting the rock-hewn churches of Lalibela, Ethiopia and the Himba of Namibia. Philip was born in Canterbury, England in 1969. After completing a Graphic Design degree at the Norwich School of Art and Design, Philip assisted some of the UK’s leading advertising photographers. Eager to develop his photographic career, Philip soon started taking on editorial and advertising commissions of his own. Since then, he has worked in over 100 countries, ranging from Antarctica to the Sahara. His journeys have taken him to some of the world’s most inhospitable and demanding destinations. Although Labilela and the Himba tribe have been photographed many times, judges say Harvey "captured the subjects in a striking way." Showcasing the depth of the rock-hewn churches in difficult lighting and the portraits of the Himba woman are "beautiful in their detail and limited color palette, capturing the tribal shapes and patterns in strong compositions," according to a statement posted in the official website. Besides Philip Lee Harvey winning award, it there were more prizes include the Young Travel Photographer of the Year, in the category Best Single Image Earth, Air, Fire and Water, Spirit of Adventure and New Talent. For Dutch photographer Marsel van Ooten, who captured eerily beautiful images of Deadvlei in Namib Naukluft National Park, Namibia, timing is key. "Fog occurs only a few times each year in Deadvlei, which is why I had to wait for many years to be able to photograph it," he said. "The fog created wonderful low contrast light and it greatly added to the surreal atmosphere." Timothy Allen (UK), a former overall winner of the awards, took the judges’ Best Single Image award in the Tribes and Spirit of Adventure portfolio categories, while Jakub Rybicki (Poland) received the same award in Earth, Air, Fire, Water. Sign up with your email address to receive our quarterly Photography Office newsletter. Rufus Blackwell’s quirky, short timelapse film of Kumhb Mela, the largest gathering of people on Planet Earth, was a vivid and colourful contrast to Fabrizi’s portfolio. Comprising more than 80,000 individual images, it secured the British photographer first prize in the HD Video category.